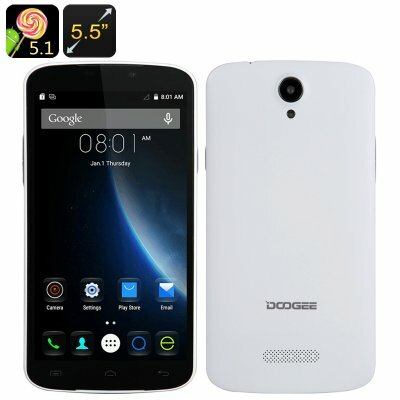 Successfully Added Doogee X6 Smartphone - 5.5 Inch HD IPS Screen, MTK6580, Android 5.1, Smart Wake, Gesture Sensing, Smart Motion, 2 SIM (White) to your Shopping Cart. The Doogee X6 Smartphone offers a beautiful HD 5.5 inch screen at under $100 that manager so offer some sensational features at a great price. This good looking phone has nice aesthetics and a silky smooth HD screen that spans 5.5 inches and bring superb quality visuals and great viewing angles thanks to the IPS technology. The buttons on the X6 don't protrude from the case like they do with most phones and are instead presented as slightly raised areas on the phones edges, all of this adds to its brilliant styling's making the Doogee X6 a real winner in the looks department. With the slim bezels around the screen this 5.5 inch phone managers to keep its size relatively small making it easier to hold and use than most of its competitors. A big plus for large screen phones. With a Quad core performance and 1GB of RAM the Doogee X6 is capable of matching all your daily phone needs and can happily rung game, play movies and multitask without any hin of lag. There are two SIM card slots that can accommodate a standard SIM as well as a micro SIM card with each of them offering 2G and 3G support across 7 frequencies. Running on Android 5.1 brings a great array of customization and familiar navigation to this phone which benefits further from Smart wake, gesture sensing and smart motion. This brings great intuitive responses for quick access to apps, instant call answering and makes interacting with he phone simple and enjoyable. A 3000mAh battery offers a day's worth of talk time so you can gossip for 10 hours without needing to recharge, front and rear cameras are also prominent and let you snap away with ease. The Doogee X6 Smartphone comes with a 12 months warranty, brought to you by the leader in electronic devices as well as wholesale Android phones..